Have you ever screwed up royally? Yep. So has every experienced nurse. Let’s admit it, sometimes we nurses make mistakes. In some cases, those mistakes can be serious, causing harm to the patient or the nurse herself. However, sometimes the mistake only causes a momentary loss of pride. Our readers have supplied a list of 10 “oops” moments that are sure to make you cringe and/or laugh in sympathy. Sleeping on the job can be hazardous to your health. 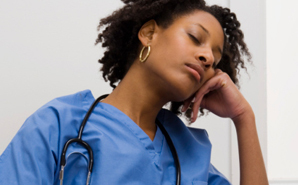 One nurse observed a night shift coworker sleeping at the desk. In her sleep, she leaned out of the chair and fell on the floor. She was hurt, but you can bet she had a hard time explaining how she managed that injury! One nurse smacked her head on the glass door of the medication administration machine, and she was out for two months with concussion symptoms. Maybe we need nursing caps to return…for our own safety. A nurse was working in an ICU unit and assisting a doctor with inserting a tracheostomy. When the passageway opened up, the patient shot bloody sputum all the way to the foot of the bed, covering the nurse from ears to waist in slime. While emptying Foley bags, a nurse managed to spill a whole liter of urine down her leg and into her sock and shoe. It still makes her shiver to this day. Cell phones aren’t allowed on many nursing floors, and for lots of good reasons. One nurse placed her cell phone in her breast pocket because she didn’t have any other place available. While bending over a full bedpan, the cell phone slipped out of the pocket and into the pan, filled with #1 and #2. No nurse—or patient!—likes the smell of Mucomyst. One nurse who had worked too many night shifts in a row accidentally injected 60cc of air into a vial of this vile stuff. The medication sprayed all over her, and the smell would not go away, even after a complete change of scrubs. One nurse was attempting to change a colostomy bag when it exploded all over her. The mess drenched her from head to toe and covered the patient. Yeah. BIG oops. New nurses often experience their fair share of oops moments. When an X-ray tech reported that a chest tube patient was trying to get out of bed, a new nurse sprinted down the hall to stop him. This was in the days of all white nursing dresses. She caught the patient, but both of them fell on the floor. When the rest of her help arrived at the door, they found the patient on top of the nurse, her dress hitched up around her waist and her black polka dot underwear showing. A nursing student decided to help out by removing a full bedpan from a patient’s bedside commode. The patient was angry and whipped her blanket onto the floor. The student didn’t see it, slid on the blanket and poured the bedpan all over her face and shoulders. Thank the Lord for Purell…she just about bathed in it to remove the nastiness. A respiratory tech got a little overexcited at a code. The nurses and doctor were working on the patient, completely in control, when the tech ran into the room, tripped and slid under the bed. The doctor, who was intubating the patient, called out, “Safe!” as the rest of the room cracked up.